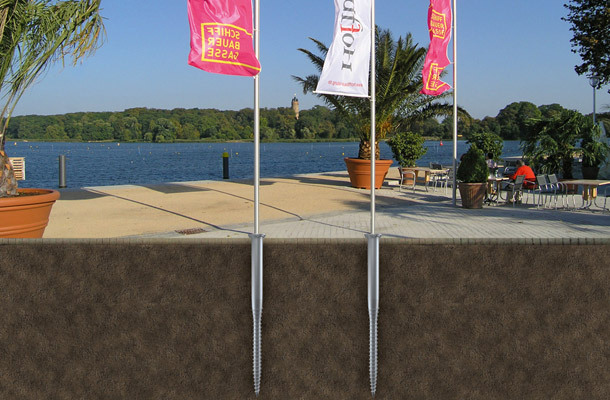 The Krinner ground screw foundation system tolerates high wind loads, guaranteeing optimum stability and safety for flag poles up to 12 metres. There is no waiting time, as the billboard or mast can be immediately installed. Using the krinner ground screw for billboards, masts and flagpoles is safe, quick, and cost effective. As it is easy to dismantle, installations can be removed as easily as they were assembled. Save time and costs, gain customers and new space with our ground screw foundation. Being quick and easy to install, krinner ground screws offer enormous savings potential. The krinner ground screw can quickly convert vacant space into innovative advertising and branding opportunities, through the use of discreet and sustainable ground engineering methods.